This post may contain some affiliate links. 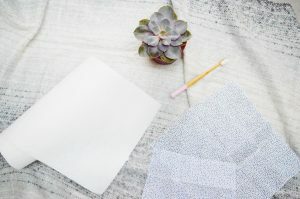 If a purchase is made, they could earn me some commission, at no extra cost to you. Do you think that more of us nowadays are a little more aware of what we’re putting into our bodies, in terms of healthy food and drink? 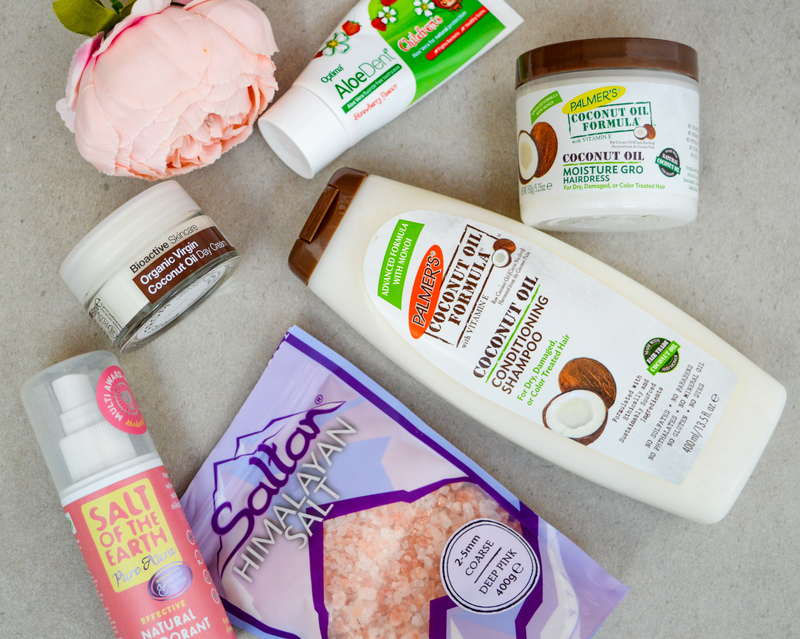 We Seem to be more familiar with natural beauty products and this term ‘clean eating‘. It is about avoiding additives, processes and artificial sweetener in our food. Which is just everywhere! So actually really hard to avoid completely. Then there’s the benefits of organic – another term now widely used. I think about the chemicals used on the crops when I’m eating my salad and strawberries. But not only are we conscious of what we put in our bodies, but what we also put on our bodies too. So many things we come across in day to day life have chemicals and so hard to completely avoid. But some chemicals are more harmful than others – or have had studies around them. Some being linked to certain cancers or fertility problems. Chemicals such as parabens, phthalates, even lead are found in our bathroom cabinets. Although I personally would love to bin all of my body lotions, makeup and detergents in favour of ‘healthier’ versions, I don’t think my wallet would be grateful. The sad truth is, most of these ‘free from’ products come with a slightly higher price tag. I went ‘natural’ when it comes to deodorant quite a long time ago. No, I don’t mean I don’t bother with it – I just stopped buying the stuff with aluminium and other harmful ingredients in the antiperspirants. It was hit and miss for a while. I work out, I walk everywhere and I have a toddler to run after. So I sweat. After trying the Lush blocks (I love Lush) I had to stop as I was still smelling. Nice. So I then turned to the tea tree roll on’s from Dr Organic and the Grapetree’s version. Still a fan I have to say. They do a fantastic job and I feel my delicate underarms (and lymph nodes) are safer without the nasties. 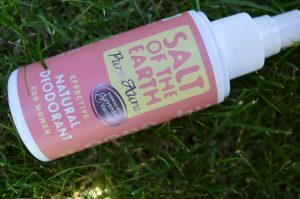 However, I discovered this Salt of the Earth natural spray when I was in Holland and Barrett. It was £5.99 for 100 ml. I was delighted – a spray! So much easier when you want to freshen up during the day and you’re out somewhere. Plus less drying time when you’re dressing in a hurry. I opted for this vanilla and lavender scent, but there were other ones too. I went with this I guess because I liked the look of the pink bottle, but in hindsight, the melon and cucumber may have been a fresher smell. This one I’m less keen on – as it has a slight ‘antiseptic’ whiff about it. However, I can live with it and I like what it’s doing. Salt of the Earth also do deodorants for men, teenagers (the girl’s one is called Rock Chick) and unscented too. Get it here. 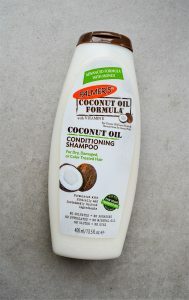 Not a new product but I’m a big fan of Palmer’s Coconut Oil Formula conditioning shampoo, for so many reasons. First of all, it’s free from sulfates, phthalates and parabens and secondly, it smells divine. The other reason I love this, is because it has helped me so much. For many years I’ve suffered with seborrheic dermatitis. My scalp was dry and flaky, with greasy patches. If I tied my hair up you could see the flakes and dry patches around the front and side. If I wore black clothes the flakes would land on my shoulders. Going to the hairdressers was a traumatic experience for me. I’d suffer with anxiety before an appointment and even cry at the thought of someone brushing through my dandruff infested hair. This is how I ended up with long hair – I simply stopped getting my once layered bob refreshed on a regular basis as I just put off going to the salon. My scalp will never be perfect, but it’s so much better than it ever was. I believe it’s because this shampoo is free of sodium lauryl sulphate (SLS). SLS is basically a detergent designed to remove grease. It’s in a number of cleaning products from bubble bath to toothpaste. But it irritates the skin, and can cause eczema type symptoms. My skin is so sensitive to this that if I get hand wash caught under my wedding ring, after a while of sitting there, I’ll get a red, sore band around my finger. So I will always promote this product. It is available in most chemists and supermarkets, and this 400 ml bottle cost £4.19 from Superdrug. Basically a serum or moisturiser to tame and condition dry or frizzy hair. 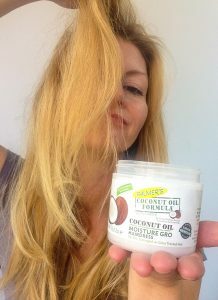 I found this Palmer’s Coconut Oil Moisture Gro Hairdress also in superdrug, £3.29 for a 150g tub. If I’m honest, I first thought it was an intensive conditioner treatment but actually this is great for my wild split ends. It says that it’s not suitable for fine hair. I guess it could weigh it down or make it look greasy, but my messy, damaged barnet loves it. You also don’t use much of it at a time, so I can see this pot lasting quite a while. 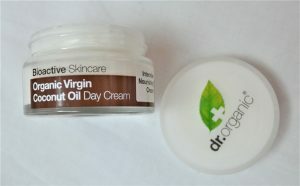 I’ve tried Dr Organic products in the past. I like their roll on deodorants and shampoo’s. So I got this pot of Organic Virgin Coconut Oil Day Cream. It has lots of pretty sounding ingredients, like ‘sweet clover extract’, butterfly bush extract’ and ‘sunflower seed oil’. In fact there are a lot of ingredients, but none of which have chemical – sounding names. Even if I have no idea what ‘butterfly bush’ is. Again, it’s coconut which smells all exotic and summery. But for my very dry/combination skin, I needed a lot of this. But once I put on my makeup my skin felt comfortable – not dry at all. I did look at the nightcream, which might do me as a daycream (if it’s thicker). But that’s only because I like to wear a lot of face cream. This was £9.49 from Holland and Barrett, so still affordable. But the jar is 50 ml, so it might not last very long. 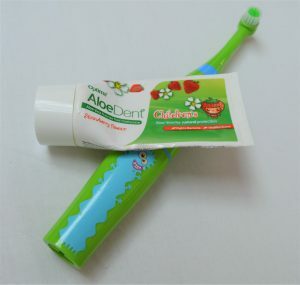 This AloeDent strawberry toothpaste is great for my toddler, because she has a habit of swallowing toothpaste when brushing her teeth. This is fluoride free and it’s active ingredient is tea tree to fight bacteria – as well as aloe vera to soothe gums. I feel better that she’s having something slightly more natural but I didn’t necessarily want her to get used to the strawberry flavour. She was fine with mint flavoured toothpaste, so I don’t think there’s any need to sway children towards fruit tasting toothpaste. However, the pro’s out way the cons with this. For 50 ml, it costs £3.59 from Grapetree and lasts ages. Pink Himalayan Salt is known for many health benefits. From providing us with minerals, balancing blood sugar levels, reducing muscle cramps and helping to regulate hormones. I only switched to pink salt recently, but I feel less guilty seasoning my food with this than with regular table salt. 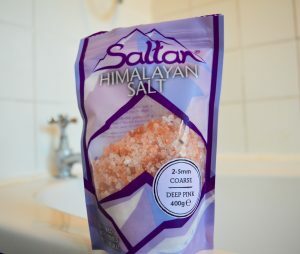 Salt has many healing properties too, and as a ‘beauty product’, this is a nice thing to add to a hot bath. It’s said to help to detox the body. I also put it in my daughter’s bath when she’s got scrapes and grazes to heal skin, or help with any sore areas. It’s affordable and Himalayan salt is available in various stores. This 400g bag of coarse rock salt cost £2.49 from Grapetree and is long lasting. Get it here.